Universal Laptop, Tablet, and Computer Monitor Mount for home and offices. Fully adjustable design with a contemporary style and function. 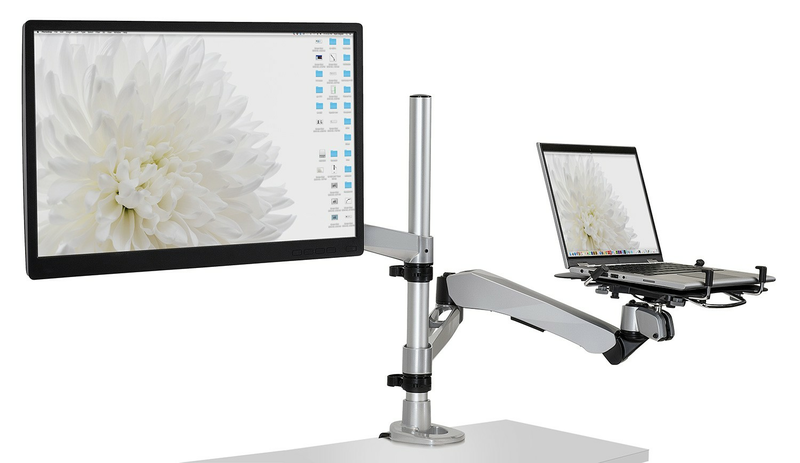 Full motion ergonomic arms articulate 360 degrees around. The Gas spring arm has a height adjustability of 15.5" up or down. Compatible with 17" laptops or less, 11" tablets or less, and 27" monitors or less. Monitors require a 75x75mm or 100x100mm VESA measurement, which can be found by measuring the holes behind the monitor. Comes with all of the attachments for laptop, tablet, and monitor mounting.